When the fall semester ended so did one of the more surprisingly cross-disciplinary classes taught at Cooper Union. "Opera," an examination of the history, materials and structures of the complex art form, has been offered three times by William Germano, Dean of the Faculty of the Humanities and Social Sciences. The class draws a broad spectrum of art, architecture, and engineering majors who come for different reasons. What makes the class so broadly appealing? 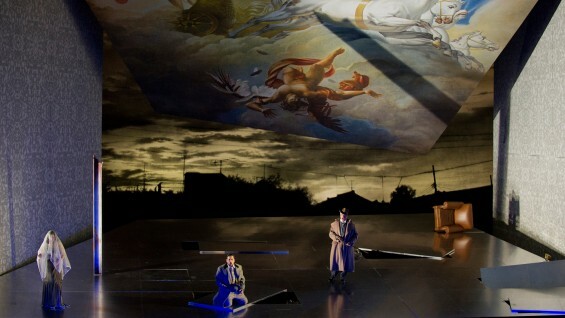 “Opera is the multimedia experience before electronic art forms come in,” Germano says. “Work in the arts today is so heavily invested in multiple mediation, and this is one of the ways of historicizing that—but it’s also giving exposure to some amazing experiments in fusing the arts.” Opera has been one of Dean Germano's passions since his days as a public high school student, when a sympathetic teacher started taking his entire Yonkers class to the Metropolitan Opera in New York City. Though Dean Germano formally pursued literature in his academic career rather than music, his interest in opera continued and matured over the years. The course he now offers at Cooper is an expression of that passion—and seems to inspire passion in his students, too. “Everybody brings something different to the class. For example many engineering students here have had some musical background," Germano says. One former Cooper engineering student, Thaddeus Strassberger (BSE’98) went on to successfully pursue a career as an international opera director and designer. Though he and Germano didn’t overlap at Cooper Union, Strassberger found his undergraduate experience instrumental to his professional ambitions. “In many aspects, producing an opera really feels like a natural synthesis of Cooper Union’s motto of advancing science and art,” Strassberger wrote in an article for At Cooper in 2010. The class makes at least one trip to the Metropolitan Opera, America's leading opera company, a short subway ride from Cooper. This year Dean Germano took the class to see a new production of Verdi's Un Ballo in Maschera [A Masked Ball].